Attacked by the Italian stallion -- and I don't mean Rocky Balboa. After two albums, Eiffel 65 had pretty much cemented their image in the music scene as merely a few guys coming up with somewhat funky and somewhat corny eurodance music. That could've been all fine and dandy, although very few in the industry could then take them seriously. But for their third album, the group abandoned much of what gained them popularity in favour of a generally new direction. 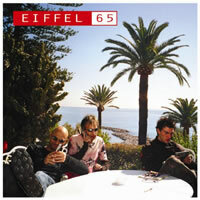 Their self-titled "Eiffel 65" album was much different: a far richer tapestry of ballads entered the forefront, caching much of their dance sound (although it IS featured in a few tracks still). As well, most of the album is actually in Italian, a stark contrast to prior works. Perhaps they can express themselves better in their native language? But what arose of these changes was a shift in the group's overall dynamic, one that may have shaken things up a bit too much for the three members (and perhaps one reason why their DJ, Gabry Ponte, was venturing more and more into solo dance-based work by this point). Typically, upon inserting an Eiffel 65 disc into their CD player (as was the style at the time), you would expect something gnarly and arm-wave-worthy to spew forth from your speakers immediately. However, as Viaggia Insieme a Me starts playing, you'll pull a spit-take instead. The song is slow. There are no unusual-sounding vocoder effects. There are no majorly-thumpin' beats. The song is in ITALIAN, for goodness sake! And you will ask, "What's going on? Where are the lousy English lyrics? How come Jeffrey Jey sounds like a person singing?" But there will be no reply, mostly because you're talking to an inanimate object, for which you should feel shame. The first song ends up sounding somewhat like something out of a music box instead of from a dance group. But perhaps it's just a fluke, right? This is the legendary Eiffel 65, who was once blue (da ba dee)! Surely they can bring back the funk! Well, Quelli Che Non Hanna 'Eto starts out more promising, sounding far more dancy than before. Ah, and there's the cheesy synth we all know and love. Yes! Eiffel 65 is back! As you listen to these songs, you may be thinking that Eiffel 65 has let you down. Or... you may actually be taking the songs for what they are and pushing aside past biases, only to discover that these slower songs aren't half-bad. In fact, they only add to the group's credibility as actual music artists beyond the fromage of the previous decade. The melodies are pleasing to the ear, and although you may not be able to understand what they're singing, it looks like they are demonstrating a strong ability to compose high-quality songs. Wonderful, is it not? No matter what your thought process is at this point, when Voglia di Dance All Night cranks itself up, you'll be extremely overjoyed. This one definitely has a dance vibe injected into it, even though it may not possess the same high tempo of older tunes. So pick up that fanny and start shaking it like party gelatin. Plus the final repeated choral lyrics will keep anyone entertained: "Last night a DJ saved my life / Singin' a-ha-ha-ha, staying alive / 'Cause you make me feel / That that's the way (uh-huh, uh-huh) I like it / Voglia di dance all night!" I was gripped to the song seven years ago when I first heard this track, and it still has a special charm to it. And, to calm down after that craziness, the symphonically-smooth La Mia Lente will help you to cool down with a soft ballad. Not many breakdancing moves to be exhibited to this one. But be sure to pick yourself up with Non E' Per Sempre, a disco-infused surprise with amazingly vocoded vocals and a background sample that could very well have been ripped from an 80s synthpop track. The only fully-English title on the album, Like A Rolling Stone, is another slow one, perhaps one of the most sluggish to be found. I am actually not particularly fond of it, save for one thing that comes up at about the 3:33 mark: the very jittery synth they use suddenly sounds an awful lot like something out of Zelda II: The Adventure of Link for the NES. But that's about it. The next track, Figli Di Pitagora, is a definite italo-dance track, no doubt. Mixed with both Italian and English lyrics, this one has a very distinct melody. Hmmm... I've heard this song twice before! Once on the Eiffel 65 album, and also a different version on group DJ, Gabry Ponte's, debut album. I don't care for either version, personally. Though it's worthy of a few spins on the dancefloor, I don't never found it to be all that great. I much prefer the subsequent song, Sopra un Palco Per Tutto il Mondo, which tells (in Italian) about their journey while touring all over the world. Initially sounding a bit slow, it soon picks up to be far more rockin'! This is an upbeat number that listeners would not have expected given the song's introduction, and it's actually quite good. Oggi is another slow song (I shall wait while you remove your surprised face), but I really dig the catchy chorus. For a long time, I surely couldn't remember the title of the song, but the melody of the chorus stuck in my head like a poorly placed gumwad. I also like the weird fact that at the end, singer Jeffrey Jey runs out of things to say and just starts scatting for a while instead. It's cute above anything else, and it adds to my overall recommendation of this track. Meanwhile, Cosa Restera' (In A Song) sounds like a leftover song from their previous Eiffel 65 album. And to a large extent it is... in fact, the hook is actually a re-lyricized version of the chorus from "Now Is Forever" from their debut album, except far more dance-oriented. Still, it's a generic dance song that doesn't catch my attention. Y'know what I'd REALLY like? I'd like to end with a ballad. We haven't had enough of those. Thanks, Lo E la Mia Stanza; you've made my day. So what do I think of Eiffel 65's third (and so far, latest -- though not the last, supposedly) album? Well, I'll say a few things about it. It's my least-revisited Eiffel 65 album, not because it's of poor quality, but more because I preferred their disco-based album, "Contact! ", instead, and I'm also not as interested in slow songs most of the time, especially while driving. As well, the fact that they produced most of their songs in Italian does create a thicker language barrier and, in effect, this may have alienated much of their international fanbase. It should be noted that they re-created many of the songs in English for a "Special Edition" of the album in 2004, but it would have been nice to have seen this done earlier. Anyway... this isn't a bad album, but it's far more slower-paced than would be expected and may turn off many fans. Still, I'd recommend checking it out to see the more mature side of Eiffel 65, something that had not yet been fully explored.